Before the season started, Mets fans probably expected more games like Saturday night’s 7-3 win against the Braves. An ace starter throws seven dominant innings. The offense relies on extra base hits to put up some crooked numbers. Once again, the Mets flatten a hapless division opponent. Of course, 2017 hasn’t worked anything like the Mets had hoped. Those hapless Braves have a better record than the should-have-been-a-contender Mets. Jacob deGrom has been an ace, but he’s been the only healthy ace. Brandon Nimmo and replacement level pickup Nori Aoki were fueling the offense. Nonetheless, Saturday’s big win reminded fans of what could have been instead of a team just playing out the stretch while booking tee times. deGrom dominates: Jacob deGrom scattered five hits over seven strong innings as, once again, the Mets’ ace relied on command and attacking the strike zone. Of course it’s easier to rely on command when you can throw the ball past people at 95 miles per hour, but deGrom hasn’t pitched this efficiently throughout the entire season. He racked up the walks trying to blow everyone away in May, and his walks have crept up again over three disappointing starts. On Saturday, deGrom recommitted himself to efficiency and overpowered the thin Braves lineup. Offense strikes quickly: The Mets got to former ace R.A. Dickey in a hurry. 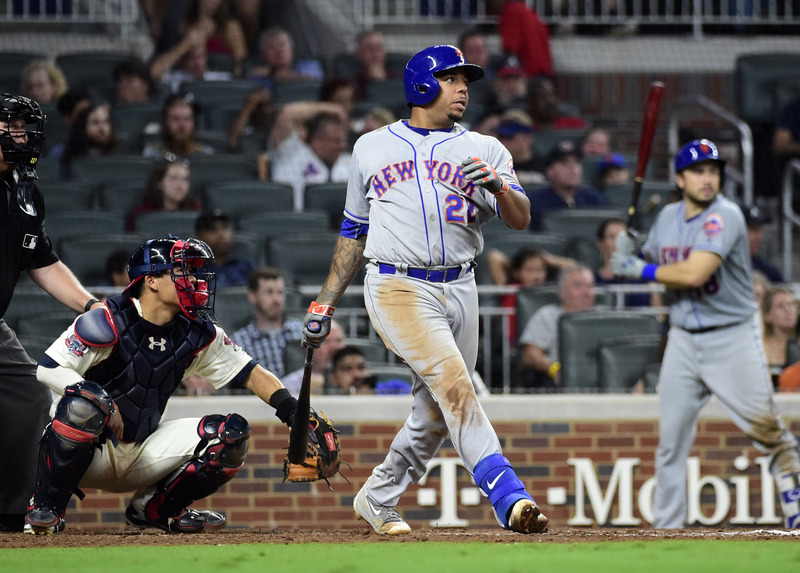 Juan Lagares singled past second baseman Ozzie Albies and Dom Smith motored around from second to score in the second inning. Gavin Cecchini drove in Travis d’Arnaud to get his first of three hits. Aoki, Nimmo, and Asdrubal Cabrera hit consecutive doubles in the third to score two more runs. Cecchini singled in another run in the fourth and Smith capped the Mets’ offense with a two-out double in the seventh. Bullpen hangs on: After a week of bad losses, Terry Collins turned to Jeurys Familia and A.J. Ramos to give them some work. Familia looked rusty as the Braves put the first three pitches in to play. A.J. Ramos started worse, walking leadoff batter Kurt Suzuki. He followed up with a wild pitch and collided with Smith going for a pop up. Ramos dug a bigger hole looking for the perfect game ending pitch against Jace Peterson, going to a full count, and giving up a single on a fastball over the middle. Ramos looked for another perfect pitch and gave up a two-run single. Once Dan Warthen came out and told Ramos to throw strikes, he was finally able to get the last out. Yesterday’s Terry Collins headscratcher: After scoring two runs off Dickey, the Mets had runners on the corners with one out. Collins asked deGrom to put down a suicide squeeze bunt. Against the knuckleballer! DeGrom missed the sign and pulled the bat back, leaving Lagares hung out to dry. What’s Next? Julio Teheran makes his fifth start against the Mets in 2017. Even in a down year, the Braves’ most established pitcher has been effectively wild against the Mets, limiting hitters to a .596 OPS.